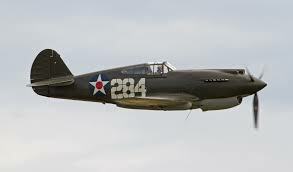 On June 25, 1942, a flight of Curtiss P-40 aircraft were on a formation training flight over the Wolcott, area. The aircraft were in a “string” formation following the flight leader. At one point the formation dove low over the water of Hitchcock Lake, and one P-40, (41-36501), struck the slipstream of the plane ahead which caused 41-36501 to dip, and the propeller to touch the water. Upon contact with the water, the propeller abruptly stopped spinning, and an instant later engine oil covered the entire cockpit canopy. The plane’s momentum carried it across the lake and into some tress at the shoreline. Although the plane was wrecked, the pilot escaped with no injuries. The aircraft were part of the 65th Fighter Squadron stationed at Rentschler Field in East Hartford, Connecticut.